A somewhat gag-group done for Otakon 2010, because it was cheap and easy and sooo much fun! 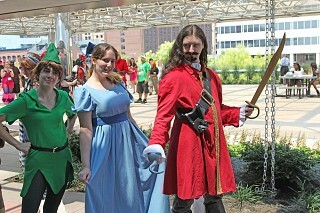 It really was a lot of fun being Wendy and having Peter and Hook around. I had lots of people say they'd never seen a Wendy before (which is just ridiculous, really). Construction for this costume was really basic. 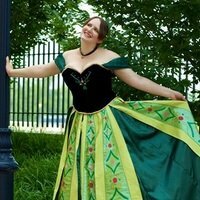 I used a simple empire-waisted dress pattern (will be updated when I remember/find which one!) with a few slight basic alterations. The dress itself is a heavy cotton/poly blend with a bit of stretch (and wonderful drapey-ness!). The hair bow and waistband are a sort of suede, which was chosen for the color. They were freehanded. The shoes were black flats from Target. They're perfect for Disney girl flats!!! I really wish I could have curled my hair and styled my bangs properly, but it was so humid and windy that day I don't think it would have made much of a difference.